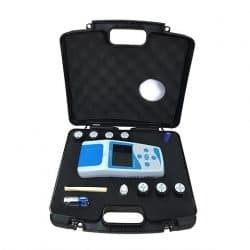 Ionix handheld Aquaculture monitors are water quality monitors are designed for field work, Ionix Handheld Series comes in Premium and Value line models. 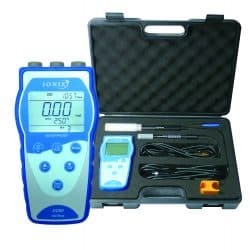 Basic, simple-to-use, and durable testers for pH, conductivity, and multi-parameters. Sturdy models that features a large easy-to-read screen (with backlight), and USB connectivity for data logging and power supply. 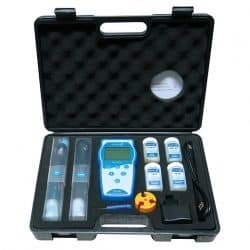 All Handheld Meters comes in a strong and rugged carry case with all accessories to be used as a portable laboratory. Clicking on the pictures below will show specification of both the Value and Premium model for each parameter. 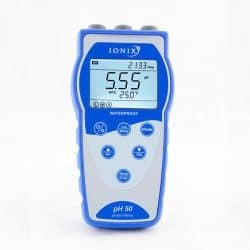 Ionix monitors are the perfect blend of functionality and affordability.